There are 40 valet spots & plenty of open parking adjacent to the building. The Winery also offers a shuttle style Limo/Town car service for a minimal fee. Complimentary Valet offered during lunch service, Monday - Friday 11:30am - 2:30pm. Valet offered for Dinner Service Tuesday-Saturday 4:30 until close. The Winery Restaurant & Wine Bar holds monthly Wine Tastings, Wine-Maker Dinners, Cigar Dinners and Social Events. Inquiry for more information. We Cater! Call our Private Event Director for more details! 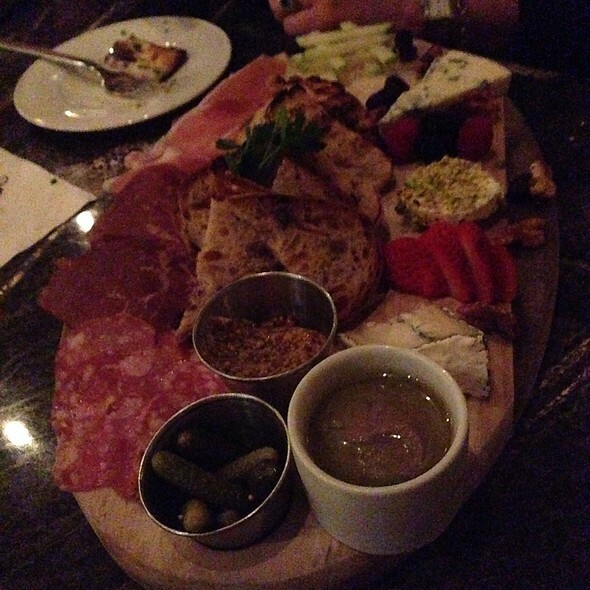 The Winery Restaurant & Wine Bar is the newest addition to The District in Tustin. The interior promises a hip, lively & sophisticated atmosphere, with dark woods, leather and velvet bar stools. The state-of-the-art 7,500 bottle cellar IS one of the largest in Orange County. The Winery Restaurant & Bar is open daily for lunch & dinner & features a wine tasting bar with a full bar menu and cigar patio. Join us to celebrate Mom! 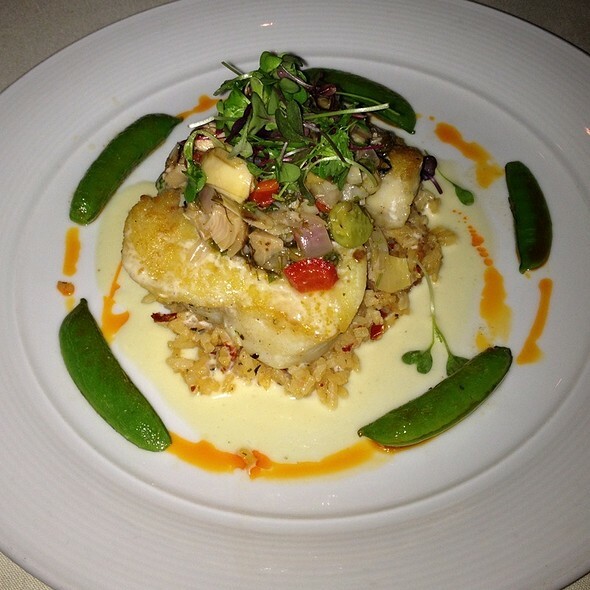 Enjoy a 3-course menu at $54.95 per person. Credit card required-please inquire for details. Great service and fantastic food. Plenty of choices to mix it up. Went for Easter Brunch so it was a set menu, but the food was fantastic. Delicious seafood and meat. Original tasty sides. Caring service. Great wine list. This is an excellent choice for a special occasion. This is the perfect place to meet out of town guests, bring business associates, bring a date, or treat yourself to a nice repast. Wonderful as ever! Sharelle always make our day!! Great food and service! Thank you! Lived the chefs table! 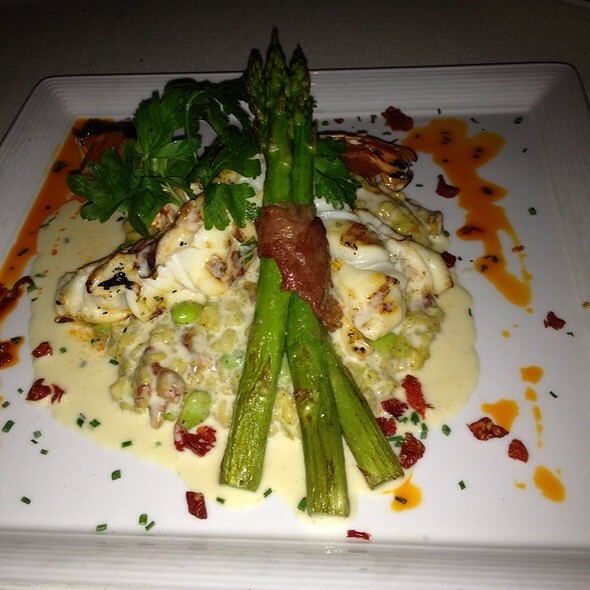 Guarantee you won’t be disappointed if you go for dinner. 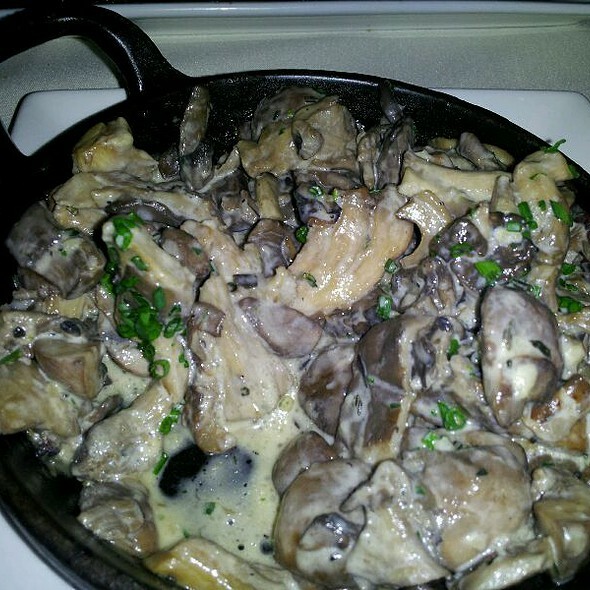 Our experience was outstanding , including the staff (over the top friendly), the delicious food, and tha cozy booths which create a wonderful ambiance. P.s. the short ribs were amazing! The entire TEAM is great. The service was timely and pleasant. I felt very comfortable while at the Winery. Except for the appetizers, main entrees came extremely slow (about an hour post appetizers), quality of food was decent but nothing stands out, waiter/waitresses were courteous, knowledgable and accommodating but also had to be flagged several times for questions and additional orders. There was one table of 4 or 5 patrons right next to our table where they were so noisy we couldn't hear our own conversations. Then we noticed that a few waiters/waitresses were engaging in laughters and joining in conversations with those particular patrons as well which indicates that they probably were regulars @ the restaurant and although it was fine with all the friendliness and such, they still need to be considerate to other patrons in their close proximity. The best place for birthdays, lunch, dinner or a private party! The staff is the best. They take care of you as a group from the time you arrive until you pick up your car! Our party of 6 were celebrating OC Restaurant Week & decided to try their $40 pp priced fixed 3 course dinner. Good choices, soup or salads, and lovely desserts. Entrees' : 3 guests had short ribs which were tender & 3 ordered the thick FLAT IRON steak (Med-rare). Sadly, it was so tough that no one ate theirs. We saw that they were fully booked & visually very busy. We knew it would take a LOT more time if we sent it back. Should've had the salmon. 1 guest took steak home, hoping to at least, salvage it in a soup. The other 2, (including me) just left it on the plate. Their wine selection was quite expansive and had good choices. The young server was professional and VERY busy. It was a lovely place but not sure if we'd go there again, if we do....no steaks for us. Great ambiance, service & wine selection. My rack of lamb was over cooked and had an unusual rub, not very good. Everyone else liked their meal. 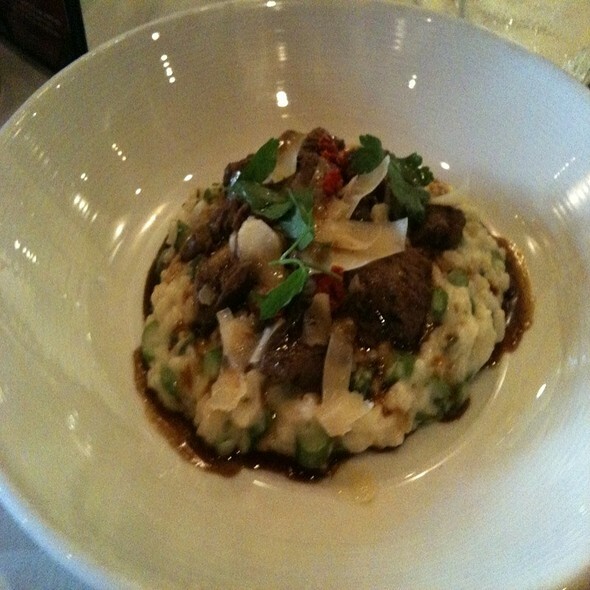 Usually the food and service is excellent - Maybe it is just the one located in Tustin. We prefer the one in Newport Beach. It seems as if the food and service is much better there. We are regulars and LOVE it. Great food, great wine, and always a very pleasant experience. We tried the "restaurant week" menu and everything was fabulous -- Falling apart braised shortrib, luscious carrot-infused couscous, crispy bacon-wrapped asparagus, mouthwatering cheesecake and a delectable CDP cabernet. What else could anyone want, honestly? Sheila, our server, was incredibly busy, but managed to take care of us well. We will be back soon! Decided to try lunch instead of dinner and it was amazing! 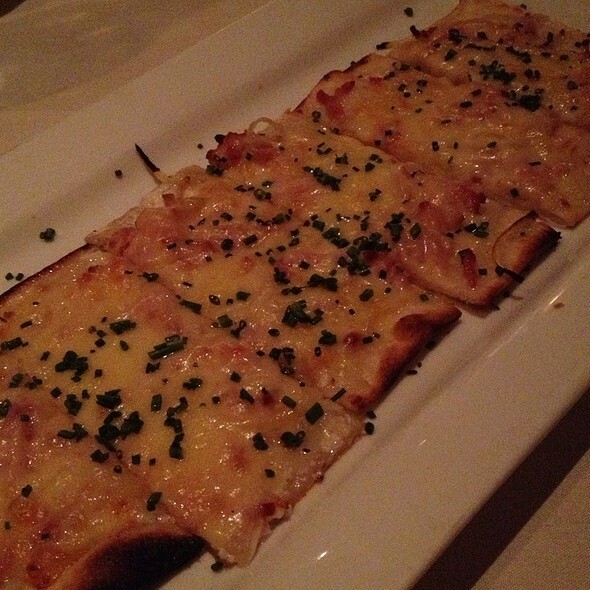 Service was spot on and we began with the Chefs signature flat bread pizza. Her Mahi mahi was delicious and my Ahi Tuna was served a perfect rare. We had a side of their "to die for" coucous that was seasoned to perfection. A nice added touch to the great service was a nice visit from Rochelle, the restaurant manager. No room for their yummy desserts but perhaps next time we will leave room. Great afternoon for sure. BRAVO! Service was barely adequate. We went on a weekday night. We were seated between two very busy tables. Not sure if that what the problem was. I understand that the tip on a four top or six top will be way higher, but still. My partner wanted the set menu which is a great deal. It was also very good. I ordered a la carte. The oysters were excellent. The salad ,was not what I expected. I ordered the Cesar and it came in a wedge. I had to cut it and needed a steak knife for that. It was clumsy and hard to manoeuvre. Bread was not offered until much later. Dinner took forever. However our wait person, seemed to be busy elsewhere ,most of the time. Since our table was very close to the four top, we did see her a lot, just not at our table. Someone else offered to pack up our leftovers. I had already received my check, when she came back to see what my partner wanted for dessert on his set menu. I asked her to pack that up also, that took a long time also. Had it been very crowded I would have been able to understand all this , however by the time this happened there were only two parties left on our side of the restaurant. All other personnel seemed solicitous and helpful. Food was great and Steven's service was excellent. The Hostess was cold and unsmiling. The place was practcally empty and she led us to a table in the walkway which I said was unaccepaable. Not a good start. Then took us to another table, which was by anopther walkway. The waiter took a long time in coming to our table.Ordered dinner, and asked to see one of the ownwers since it was recommended by someone who knew him. After three tries, he condenscended to staop by our table for one minute, and did not see him again all evening? Ordered a filte Mignon 16oz with bone in and some french fries, When I got the steak, it was half the size as advertised, and the french fries were cold and had to seek someone to send them back. The noise level was also very high. Felt very uncomfortable as we did not have any service to speak of. I went to the Winery with very high expectations, and was very disappointed. The costs were very high as well. I do not mind paying for quality, but it was not there! I will not go back asI felt out of place even if they offered me a free meal! Adioa, goodby! Service was fantastic. They do a coat check for you in the beginning. The food came out great. My boyfriend had the duck and I had the rib eye. Just wonderful and delicious. I would definitely recommend this place to anyone. The wine steward was excellent, however the rest of the service was disjointed. The appetizers were so-so (calamari and pork belly). 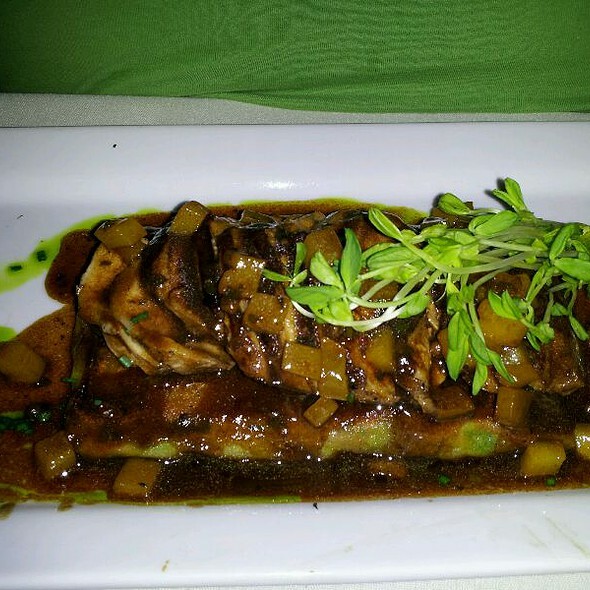 The rack of lamb and mahi-mahi were excellent. Delicious food and wine. A true foodie experience. Not a random Tuesday experience -unless you can afford it. Wonderful calamari appetizer. Great value wine suggested by the sommelier. Bone in ribeye perfectly prepared. Attentive service. Overall a great experience. Pricey but worth it! The service was amazing. Our server was very attentive and knowledgeable. She knew which wines go with with foods. She definitely made sure we were taken care of. Great food, great service, terrific wine list. . .What else would anyone need? Hubby ordered Salmon, Quinoa and Asparagus (fish was flaky, juicy, and fresh). I had the Shrimp and Scallops with butternut squash/mushroom Risotto (tasty, rich and decadent). CDP red for me (yum!) and St. Supery white for him. Our server, Katie, was very friendly and professional. Thanks, everyone, we will return. This restaurant needs to go through the Gordon Ramsay 24hr Hell on kitchens makeover. All fish smell all food made us sick. Horrible Ambiance. Service was great. Value is awful. Definitely time for a bottom to top and top to bottom and left to right cleaning and overall. One of my favorite places, the food, the service, and then welcoming staff are amazing. Starting from the valet, I knew something was going to be wrong, and it was! The quality of the food was poor and way overpriced. The setting in the restaurant not good enough and service was fairly poor. No coming back! Amazing service and ambiance. The food was phenomenal just a bit pricey. I want to thank James our server. He made this one of the better dinner experiences I have had in awhile. 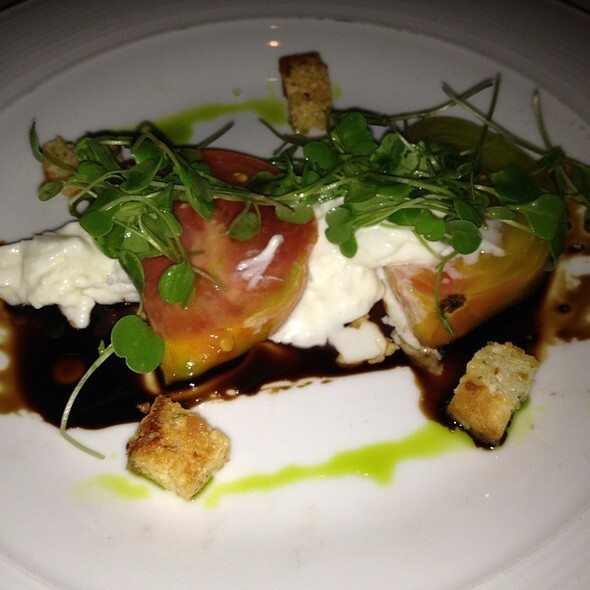 His attention to detail and the presentation of our meal made the experience outstanding. I will definitely be back. Awesome food! Many of the tables are right next to each other. A little hard to have private conversations. But, definitely Go! Food and service are excellent. While we have always appreciated the high level of service and professionalism at this restaurant not to mention the delicious food. This night was very busy and we waited a long time for the food. We picked the perfect rainy Sunday night to go out for an early Valentine's day dinner. The petite seafood tower was amazing for starters. The tower has shrimp, crab, oysters, lobster tail and ahi tuna. The entree's, duck confit and the braised Angus short ribs were delicious and fork tender. 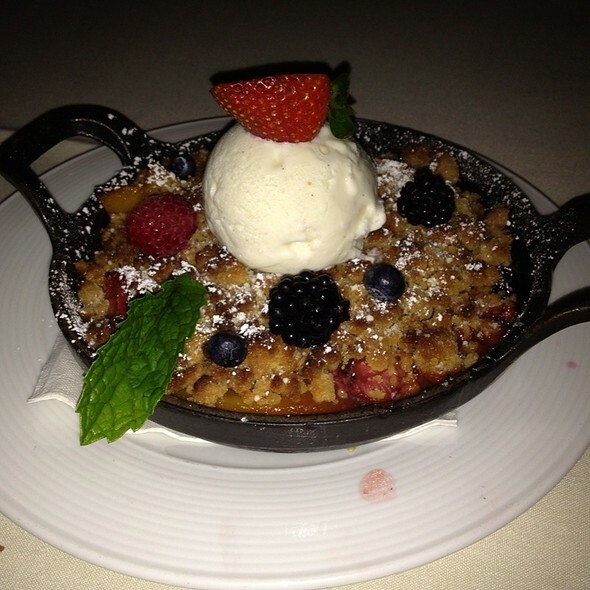 The fresh berries and peach cobbler made the perfect end to an amazing dinner. Service was "spot on" with our server James. Had a nice visit from one of the founders William which was an added bonus. We will be back for sure. BRAVO! We were celebrating a special occasion and this was our first time here. The staff was outstanding and even though we were late for our reservation, they were still able to seat us. Our waiter was very attentive, the food was amazing and the wine was even better. It's been a long time since we've been to a restaurant and had all nice things to say! We thoroughly enjoyed ourselves and will definitely be back.